The first time I made this recipe, I made a batch using fresh figs from the neighbor’s tree. The second time, I bought the above figs from Central Market and made a batch of 5. To make these beauties you will also need a high quality coconut oil (I used the Nutiva brand), cocoa powder, your sweetener of choice, and espresso sea salt as an optional ingredient. Take a small bowl and add about 1 tbsp of melted coconut oil. Slowly mix in 1 tsp of cocoa powder at a time, stopping when you have the consistency you want. I ended up using approximately 1/4 to 1/3 cup cocoa powder. I recommend making it on the thicker side so it coats the fig better. For the sweetener, I pulsed 1/4 cup coconut sugar in a coffee grinder and combined it with my chocolate mixture. You’ll notice in the photos above that the chocolate looks grainy – that’s the sugar. I personally just wanted them to taste good, so I didn’t mind. But if you’re serving these at a party or gathering, or giving them as a gift and you want them to have a smooth appearance, then I would recommend using stevia powder. You won’t need very much because it’s so concentrated, so add in teensy weensy amounts at a time, tasting it as you go along. 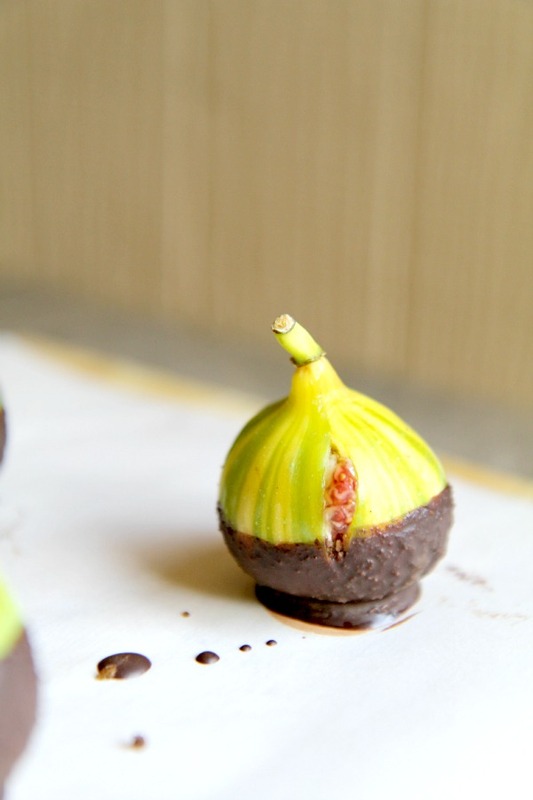 Hold the fig by the stem and dip them into the chocolate. You might need to tip the bowl a little and rotate the fig to get the mixture to coat evenly. 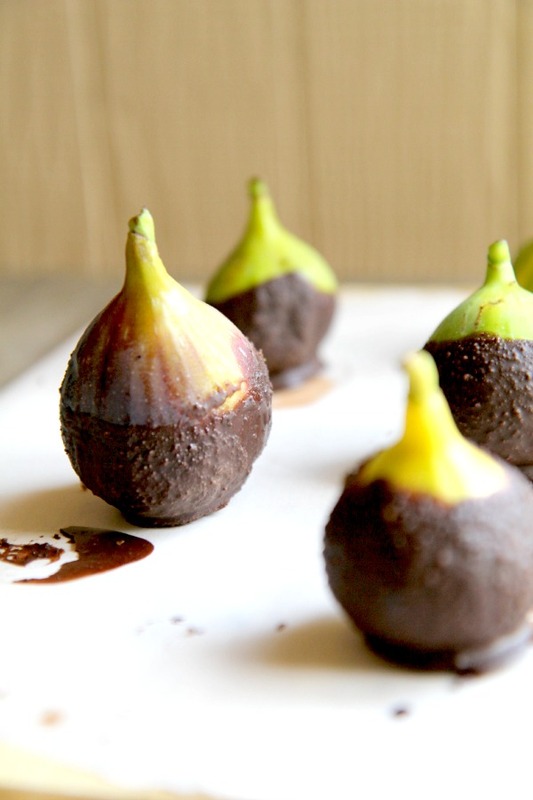 Place the figs on a flat surface (plate or cutting board) that is covered with parchment paper. Put in the fridge for at least 20 minutes to let the chocolate harden, then take them out and dip into the chocolate for a second coating. 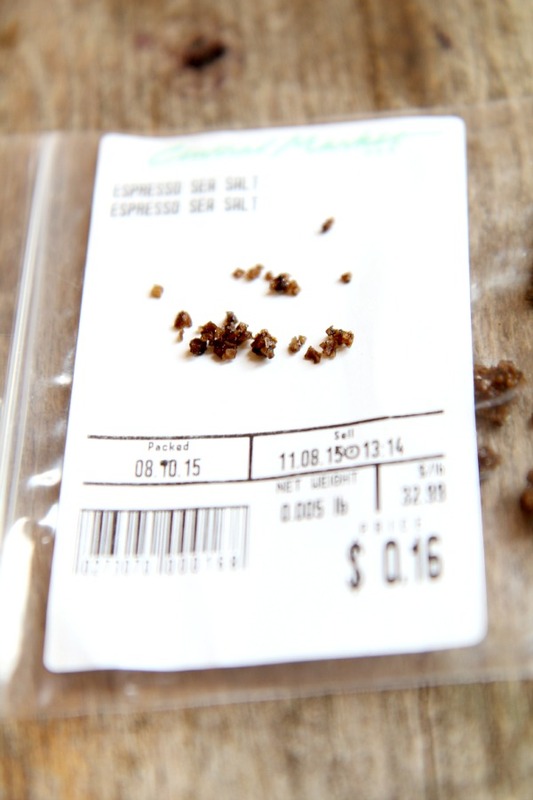 I bought this espresso sea salt at Central Market from their bulk foods section, in the aisle with all the seasonings. I got maybe 1 teaspoon and it only cost me 16 cents! After I dipped the figs into the chocolate a second time, I lightly pressed 3-4 pieces of the salt into the bottom of the fig. It just adds a little extra kick when you bite into it. Sea salt flakes would also work is you don’t have access to espresso sea salt or don’t like the espresso flavor. Place back in the fridge for another 20 minutes or until hardened. They’re ready to eat at this point. You can store extras in a sealed container in the fridge for 2-3 days. If you have any extra chocolate leftover, I recommend stirring in sunflower seeds, spreading out on parchment paper and placing in fridge – you’ve got another yummy treat – chocolate covered sunflower seeds! Other ideas: nuts, raisins, banana slices, etc. Just note that this chocolate is rather fragile and will melt easily at room temperature, especially in the summer. 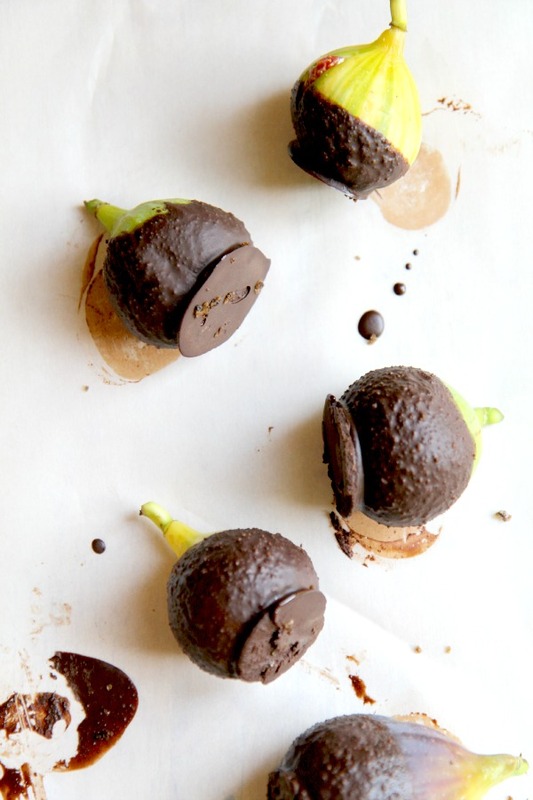 This 5 ingredient, 1 bowl recipe for Dark Chocolate Dipped Figs is vegan, incredibly sweet & juicy, with chocolately goodness and a hint of saltiness! Take a small bowl and add about 1 tbsp of melted coconut oil. Slowly mix in 1 tsp of cocoa powder at a time, stopping when you have the consistency you want. Make it on the thicker side so it coats the fig better. 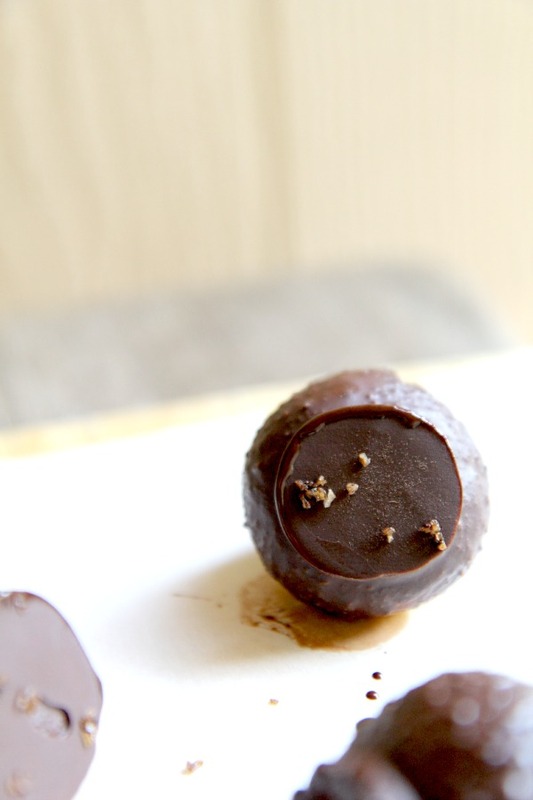 For the sweetener, pulsed 1/4 cup coconut sugar in a coffee grinder and combine it with chocolate mixture. It may give the chocolate a grainy texture so if you're serving these at a party or gathering, or giving them as a gift and you want them to have a smooth appearance, then I recommend using stevia powder. You won't need very much because it's so concentrated, so add in teensy weensy amounts at a time, tasting it as you go along. 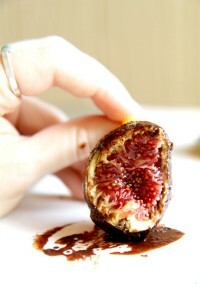 Hold the fig by the stem and dip into the chocolate. You might need to tip the bowl a little and rotate the fig to get the mixture to coat evenly. 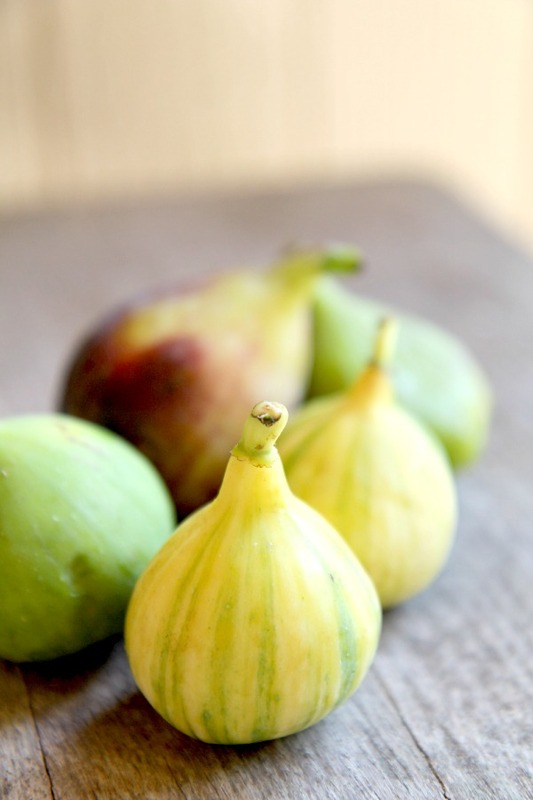 Place the figs on a flat surface (plate or cutting board) that is covered with parchment paper. Put in the fridge for at least 20 minutes to let the chocolate harden, then take them out and dip into the chocolate for a second coating. Lightly pressed 3-4 pieces of the salt into the bottom of the fig. Place back in the fridge for another 20 minutes or until hardened. They're ready to eat at this point. You can store extras in a sealed container in the fridge for 2-3 days. If you have any extra chocolate leftover, I recommend stirring in sunflower seeds, spreading out on parchment paper and placing in fridge - you've got another yummy treat - chocolate covered sunflower seeds! Other ideas: nuts, raisins, banana slices, etc. Just note that this chocolate is rather fragile and will melt easily at room temperature, especially in the summer. Enjoy! I’ve got some hearty fall recipes in the queue for the coming weeks. All vegan, all gluten free, all freaking delicious! ? Plus blog posts about my recent travels around Texas, as well as a visit to a cattle ranch turned vegan farm animal sanctuary, so stay tuned!